Beauty surrounds you everywhere you turn here, especially the architecture. The iron window railings, shutters and buildings are pieces of artwork. 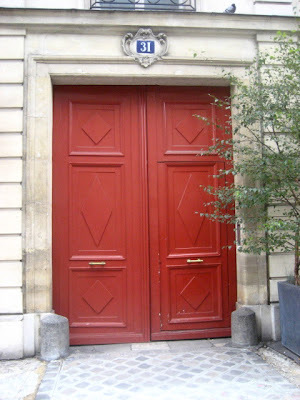 Every building has a massive wooden door, some with elaborate carvings and in beautiful color pallettes. The door knockers are all original hardware dating back to the 18th and 19th centuries. 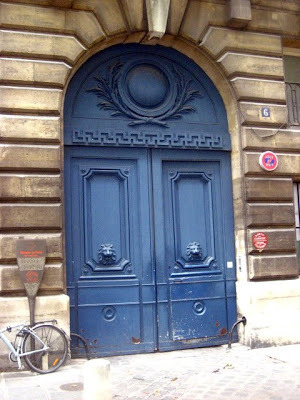 You could make a coffee table book just on the doors of Paris (I am sure that there is one out there!). I will back in my New Jersey kitchen cooking on Tuesday and have some good ideas. Au Revoir Paris! Until next year! Thanks for checking out my blog posts from this beautiful city. See you with some recipes mid week. I loved reading about your adventures in Paris! I think of only food ALL day. Have a safe trip back. You "educate" us.. as we vicariously live through your trip. Thanks for the adventure! "See" you back home. Wow, very pretty. I'd love one. I enjoyed all your adventures in Paris. I hope you have a safe trip home. I'm looking forward to your recipes!! I had a blast in Parish with you! 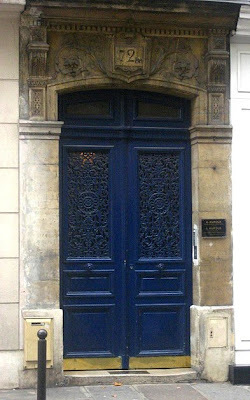 All those doors in Paris are just wonderful. 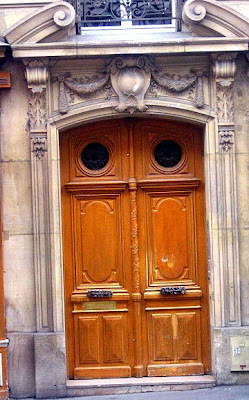 You can't beat all those centuries-old doors everywhere in Europe for charm, for security, for beauty. Hope you have a good re-entry to the states. Now get cooking and give us some of those great Parisian recipes! I'd better get my walking shoes together to work off the fabulous recipes you'll be posting. What duck episode? Hmmm, I'll have to read our back postings and see if I can find it! It goes so fast, doesn't it? Can't wait for your return and subsequent new recipes. These doors are amazing! I sure did enjoy the trip. 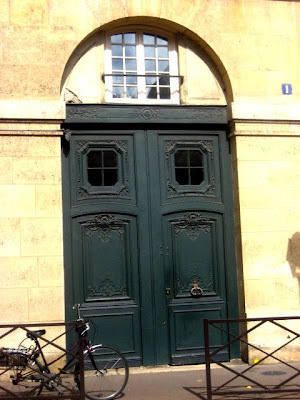 French doors are beautiful, aren't they? I also love the shutters on the doors and the terraces. If we were younger, we'd live there. I'm so glad you have taken us along on your trip. We'd planned to go this year for my special birthday, but it got postponed. You've helped to make up for it. Merci beaucoup. I love this! I am a chronic "door photographer" when I travel in Europe!